A FUN-tastic New Year's Eve Celebration at Blue Ocean -- The Fools, Optional Dinner Buffet, Champagne Toast, Party Favors and Midnight Balloon Drop! Ring in the New Year with unforgettable fun at Blue Ocean featuring New England’s best party band, The Fools. The party features an optional dinner buffet, expansive dance floor, midnight champagne toast, party favors and a balloon drop. Dinner + Show – Combo ticket includes a savory NYE Dinner Buffet served in the panoramic oceanfront Grandview Hall, on the upper level above Blue Ocean Music Hall. Seats are reserved for ticketholders in both Grandview and Blue Ocean Music Hall. Dinner tickets are limited. Menu and more info below. Show Only – Blue Ocean Music Hall doors open for concert-only ticket holders at 8pm. Limited Reserved Seating and Standing Room Only tickets available. Don’t wait, tickets to this incredible celebration will sell fast! If you are purchasing a dinner/show combo ticket, you will be assigned to the same table number in both Blue Ocean Music Hall and Grandview Hall. You must present your ticket for entry in each location. Blue Ocean Music Hall regular menu service WILL NOT be available on New Year’s Eve. Selected snacks will be available between 8PM-10PM. MIDNIGHT COUNTDOWN & CHAMPAGNE TOAST, PARTY FAVORS AND BALLOON DROP! A midnight champagne toast for each 21+ guest and a festive assortment of New Year’s Eve party favors will be distributed to each table. Experience The Fools wild and crazy 2018 countdown with a midnight balloon drop over the expansive dance floor. Please note: Television broadcast of the ball drop in Times Square will not be available in the Music Hall. 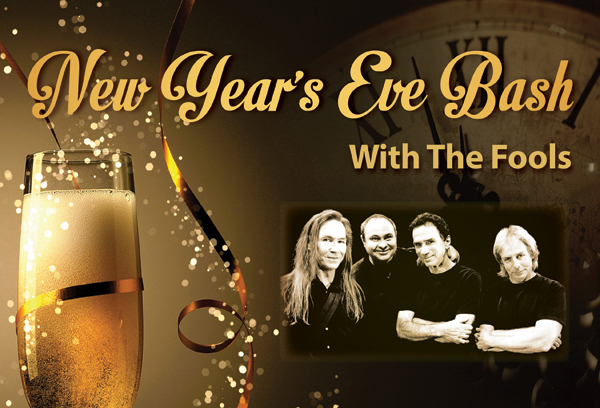 Get Ready for a New Year's Eve you won't forget with New England's fun party band, The Fools!